As per the latest trend, our IBPS Guide is providing the updated New Exam Pattern Quantitative Aptitude questions for SBI PO 2019 Day 9. Our Skilled experts were mounting the questions based on the aspirant’s needs. So candidates shall start your preparation and practice on daily basis with our SBI PO pattern quantitative aptitude questions 2019 day 9. Start your effective preparation from the right beginning to get success in upcoming SBI PO 2019. 1. A, B and C started a business by investing Rs. 45000, Rs. 32000 and Rs. ______ respectively. After 5 months, A withdraws Rs. 15000 and B invested Rs. ______ more. And after another 3 months, C invested 25 % of initial investment more. The ratio of share of A, B and C, at the end of the year is 435: 440: 364. Which of the following options satisfy the given condition? 2. A shopkeeper allowed ____ % discount on an item on the marked price and he suffered a loss of _____ %. If he allows only 10% discount, then the profit percentage would be 8 %. Which of the following options satisfy the given condition? The difference between Simple interest and Compound interest on a certain sum at the rate of _____% per annum for two years is Rs. _____. The simple interest on the same sum at the rate of 15% per annum for 5 years is Rs. 33750? This option doesn’t satisfy the given condition. ____ litres of mixture of milk and water contains milk and water in the ratio of 3 : 2. The ____ litres of water should be added to the mixture to get 45 % milk on it. 25 litres of water should be added to the mixture. 30 litres of water should be added to the mixture. 33.33 litres of water should be added to the mixture. The average weight of _____ persons is increased by 3 when one of the person whose weight is 58 kg replaced by 2 women. The average weight of 2 women is _____ kg. 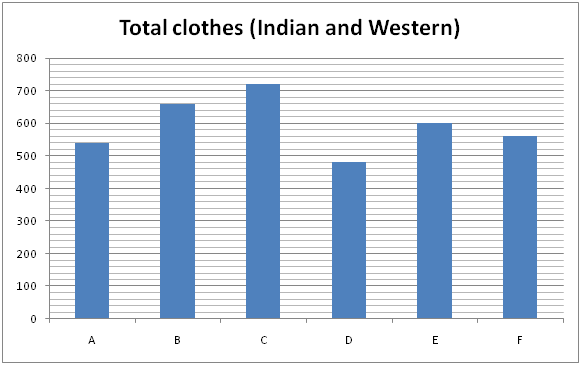 The following bar graph-1 shows the total clothes (Indian and Western) in 6 different shops and the bar graph-2 shows the total Western clothes in the shops. 6. Find the ratio between the total clothes (Indian and Western) in shop A and C together to that of total western clothes in shop B and D together? 7. Find the average western clothes in shop A, C and E together? 8. Total Indian clothes in shop A and B together is approximately what percentage of total western clothes in shop B and F together? 9. Find the difference between the average number of clothes in shop A and F together to that of the average number of Indian clothes in shop C and E together? 10. Total Western clothes in shop B and C together is approximately what percentage less than the total clothes (Indian and Western) in shop A and D together? 1) A, B and C started a business by investing Rs. 45000, Rs. 32000 and Rs. ______ respectively. After 5 months, A withdraws Rs. 15000 and B invested Rs. ______ more. And after another 3 months, C invested 25 % of initial investment more. The ratio of share of A, B and C, at the end of the year is 435: 440: 364. 2) A shopkeeper allowed ____ % discount on an item on the marked price and he suffered a loss of _____ %. If he allows only 10% discount, then the profit percentage would be 8 %. 3) The difference between Simple interest and Compound interest on a certain sum at the rate of _____% per annum for two years is Rs. _____. The simple interest on the same sum at the rate of 15% per annum for 5 years is Rs. 33750? 4) ____ litres of mixture of milk and water contains milk and water in the ratio of 3 : 2. The ____ litres of water should be added to the mixture to get 45 % milk on it. 5) The average weight of _____ persons is increased by 3 when one of the person whose weight is 58 kg replaced by 2 women. The average weight of 2 women is _____ kg. 6) Find the ratio between the total clothes (Indian and Western) in shop A and C together to that of total western clothes in shop B and D together? 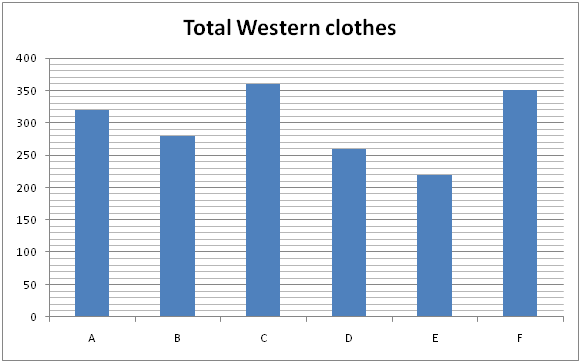 7) Find the average western clothes in shop A, C and E together? 8) Total Indian clothes in shop A and B together is approximately what percentage of total western clothes in shop B and F together? 9) Find the difference between the average number of clothes in shop A and F together to that of the average number of Indian clothes in shop C and E together? 10) Total Western clothes in shop B and C together is approximately what percentage less than the total clothes (Indian and Western) in shop A and D together?